The 14th Annual Barber Vintage Festival. The 14th annual Barber Vintage Festival provides motorcycle enthusiasts with three action packed days consisting of on-track racing, bike shows, stunt performances, motorcycle displays and more. This event honors the beginnings of motorcycling history, taking audiences on a journey from the past to the present. This year, BMW Motorrad will showcase its customizable Heritage family of motorcycles – the R nineT, R nineT Scrambler, the R nineT Pure, the R nineT Racer, and the R nineT Urban G/S. And don’t miss your chance to take a demo ride on our latest models, so be sure to bring proper riding apparel. Plenty of Things to Enjoy! The Annual Barber Vintage Festival is one of the most highly anticipated motorcycle events in the world. The three-day festival features the fan zone with food and entertainment, Ace Corner, a swap meet with hundreds of vendors selling vintage motorcycles and parts, as well as the VJMC gathering, and the Motorcycle Classics show. Read about these attractions – and more – below. Don’t forget… the Barber Vintage Motorsports Museum features extended hours as well as seminars during the 14th Annual Barber Vintage Festival. So when you’re not in the park, be sure to check out what’s going on in the museum! The American Motor Drome Company’s “Wall of Death”, gives you a glimpse into the century-old sport of board track racing. Spectators stand on a platform that circles a 15-foot-high wooden “bowl”, inches away from the motor drome’s daredevils riding their vintage Indian and antique Harley-Davidson motorcycles around and around the vertical track. Built in partnership between Ace Cafe London and Dime City Cycles, Ace Corner Barber is an area dedicated to Cafe Racers, custom builds, and cool vintage bikes, whether made of steel, or flesh and bone. Ace Corner Barber is a celebration of the timeless, teeth-chattering, soul-shaking speed machines and riders that hailed the streets of London in the 50s and 60s. The best way to describe us is just KSFMX Freestyle Motocross show. Freestyle motocross (also known as FMX) is a variation on the sport of motocross in which motorcycle riders impress Crowds with doing tricks while jumping 75′ and 30′ in the air. Demo Rides will be in Lot D at the following times. Celebrating vintage motorcycles of all types, the VJMC gathering takes place in Lot A. Enjoy motorcycle shows, items for sale, contests, awards, seminars, and much more! Click here for the VJMC Schedule. Motorcycle Classics is a favorite magazine of motorcycle collectors, enthusiasts, and restorers. 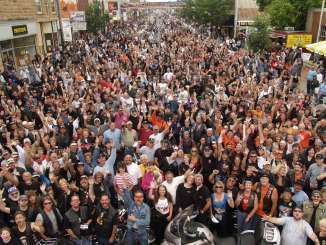 Their audience includes those who are new to the sport, as well as lifelong motorheads who’ve always had a love of classic bikes. During the Barber Vintage Festival,Motorcycle Classics hosts a motorcycle show with awards given to the best of the best. Meet the magazine’s editor, see what’s for sale, and check out which motorcycles they’ve chosen to showcase at this year’s event. Click here for Motorcycle Classics schedule. Built back in 1912 by Jose Urias, the Globe of Death is a 16-foot-wide sphere made of metal and mesh. For generations, members of the Urias family have ridden their dirt bikes inside the globe at speeds of up to 60mph. Don’t miss this opportunity to see these motorcycling “daredevils” perform some truly extraordinary stunts!